When I heard about Small Business Saturday, held this past weekend, I thought – great – a sanctioned opportunity to acknowledge small businesses and support the local economy around the busiest shopping season of the year. I was so taken with the idea, being a sole proprietor and all, I wanted to find out more. Was it government-sanctioned day? A media-created event wedged in between Black Friday and Cyber Monday? With a little research, I found out that it’s neither: American Express OPEN was sponsoring and promoting Small Business Saturday. That’s right. American Express – the mega-company shunned by many small businesses for its high acceptance fees. Conversely, many locally-owned shops wouldn’t be around if it weren’t for their Amex line of credit and loans, so it’s a difficult pill to swallow: small businesses can take advantage of this great awareness tool handed to them on a silver platter, but it’s given to them by someone they don’t really want to touch. For American Express, though, it’s a win-win: getting mega-amounts of local and national publicity, showing concern for a larger cause and community, and possibly getting more business on November 27 and beyond. There are 28 million small businesses in the U.S. according to the Small Business Administration, and even though many don’t take Amex, that hasn’t stopped a lot of them from embracing the opportunities Small Business Saturday offered (by the way Small Business Saturday is a service mark by Amex so they literally own the day). Amex was smart to include all businesses in this promotion, not just Amex-takers. After all, how could you pull this off if you only included your customers? Benefits to small business owners included: the first 10,000 to sign up received $100 of free Facebook advertising (Facebook also donated $500,000 in credits for future use). Amex also made Small Business Saturday promotional material available for download – complete with Amex logo – for posting at brick and mortar stores and web sites, along with advice and consulting services on the Amex OPEN web site. The campaign also included TV and print advertisements. In addition to creating a lot of awareness for locally-owned businesses, Small Business Saturday has scored big with local and national civic and advocacy organizations like Chamber of Commerces, Better Business Bureaus, womens’ groups, among others. Amex even committed to donating $1 to the nonprofit Girls Inc. for each “like” on its Facebook page, up to $500,000. (Their page hit over 1 million “likes” – pretty impressive by any standards). All this fanfare also moved local and national politicians to support Small Business Saturday and has generated a flurry of media attention. When was the last time you heard the government and news outlets promoting a company’s marketing campaign? 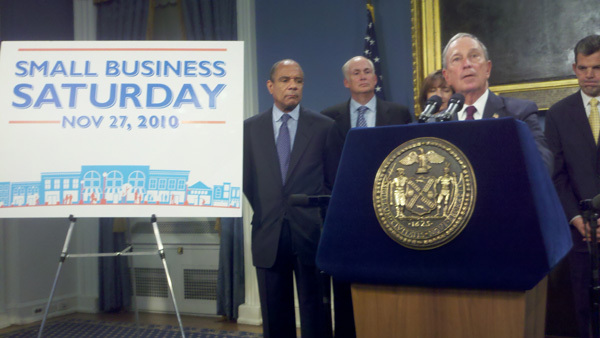 Mayor Bloomberg of New York City promotes Amex’s Small Business Saturday with American Express CEO Kenneth Chenault far left. And Amex didn’t stop at courting businesses, consumers who registered their American Express card received a $25 statement credit for spending more than $25 at a locally-owned, independent small business that accepts American Express on Nov. 27. Good for shoppers and great for Amex. This “movement”, as it is called on the Small Business Saturday web site, would be called “astroturfing” if it were in politics – lobbyists attempting to make a money-backed cause look like a grassroots campaign – but it will likely go down as a brilliant corporate marketing strategy executed with laser-like focus and precision. Though the results of the success of Small Business Saturday and long-term reverberations for small businesses, consumers, and Amex are yet to be determined, Amex took extreme care to package its gift to small businesses and consumers, honing in on the needs of a stuttering economy, taking advantage of seasonal interests, employing social media savvy, and lovingly wrapping it in American Express logo paper. It may not be the most authentic gift to the U.S. economy, but the recipients couldn’t wait to open it. Janice thanks for nailing the manipulative ways that these kinds of companies stay on top—pretending to be the government and acting in sync with government agencies….it’s like the New Deal for small businesses, except by Wall Street itself. Here I thought I was doing something “good” but shopping local but once again it is masked for big companies (like AmEx) to make the big bucks. Thanks for sharing and giving me some insight.